Love Sessions: 11 Nights of Giving. 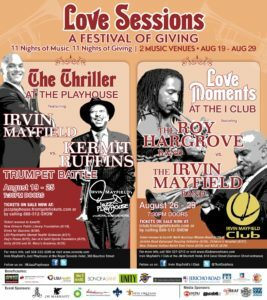 7 nights at Irvin Mayfield’s Jazz Playhouse followed by 4 nights at Irvin Mayfield’s I Club. Ticket sales each night go to a different charity. Irvin’s beautiful new book/cd, A Love Letter to New Orleans, will be available each night. $24 of each book sold will also go to the charity of the night. Kermit Ruffins’ CDs, including his latest, Happy Talk, will be available as well, and $3 of each CD sold will go to the charities. Charities supported include New Orleans Public Library Foundation (8/19), Dress for Success (8/20), LSU Psychiatric Mental Health Services (8/21), Dag’s House (8/22), Son of a Saint Sports Foundation (8/23), Unity (8/24), St. Mary’s Academy (8/25), North American Mission Board (8/26), Jericho Road Episcopal Housing Initiative (8/26), Children’s Hospital (8/27), New Orleans Haitian Relief Task Force (8/28), and New Orleans Jazz Orchestra (8/29). If a show says “sold out” come out about 9p and space will open up. Doors 7:30p. Show 8:15p. Irvin and Kermit are taking this thing seriously. Watch how they are working out HERE. Read a feature story in the Times-Picayune and Nola.com on the battle HERE. Can’t be here but want to feel you’re a part of it? Visit our online store and we’ll donate $3 for each CD purchased and $4 for each book to the causes from 8/19/11 through 8/29/11. Wish I was there. Enjoying a lovely end of summer at home here on Peaks Island, Maine. But could stand a hot night of trumpet in New Orleans.